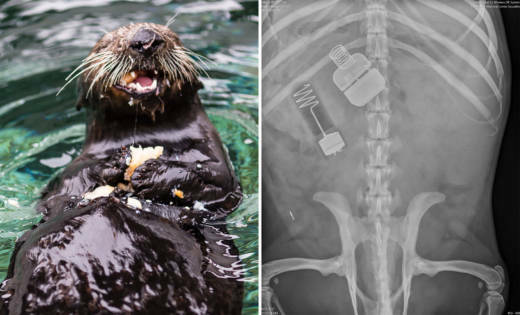 On a recent Thursday, Otto skipped his $12 seafood breakfast to prepare for surgery. The 8-year-old southern sea otter was poisoned by exposure to toxic algae, likely after eating a batch of crabs. Toxic algae forms in warming ocean waters and produces a neurotoxin called domoic acid. This neurotoxin concentrates as it moves up the food chain, and it can cause seizures in marine animals and humans. During the winter of 2015 to 2016, domoic acid poisoning shut down the commercial crab season for more than four months. This year, the number of sea otters stranded on California beaches is up considerably, says Mike Harris, a sea otter biologist with the California Department of Fish and Wildlife. "We're on pace in 2017 to break some new records for live strandings and carcasses recovered," he says. Scientists still know very little about how domoic acid affects sea otters off the California coast. But in Otto's case, a recent MRI showed damage to the hippocampus, which affects memory and navigation. Otters use these functions to find their way in the open ocean. 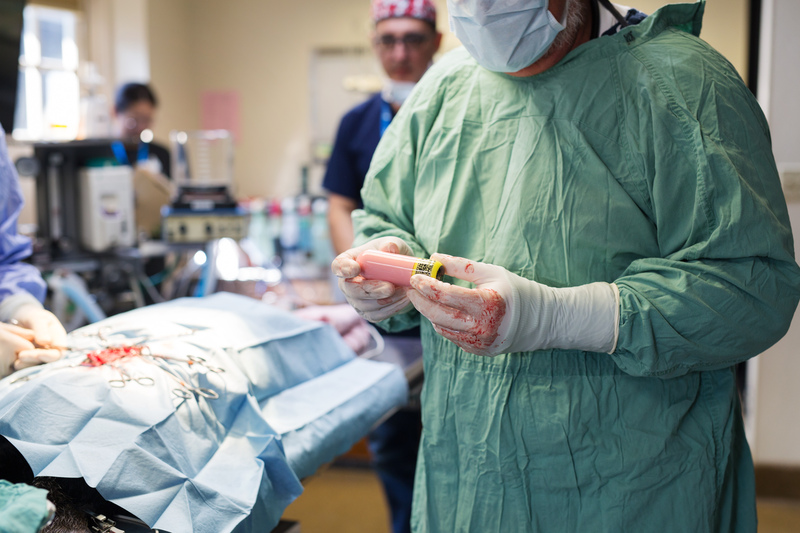 That's why veterinarians at The Marine Mammal Center in Sausalito decided to try a novel surgery on Otto, which would allow them to monitor his location and learn how the domoic acid poisoning affects him over time. “It’s definitely a unique procedure," says Shawn Johnson, the center's Director of Veterinary Science. To prepare Otto for surgery, veterinarians can't shave his fur like they would for a cat or dog. Otters rely on their thick coat to stay warm so shaving it would expose them to cold California waters, potentially leading to hypothermia. Young carefully parts the hair to expose a thin line of skin, then smooths the fur down with a gel to hold it in place during surgery. The purpose of the surgery is to tuck two devices into Otto's abdomen. One, a VHF transmitter, will allow scientists to track Otto’s location at sea. 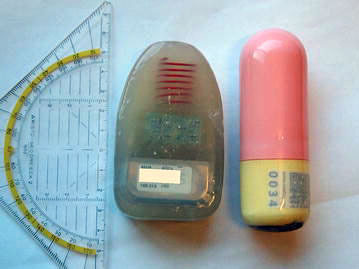 The other tag, shaped like a pill, will track how he fares once he's back in the wild. This "life history tag" will measure light and temperature from inside the animal's body. Once he dies, Otto's body will start to decompose almost immediately. Enzymes and chemicals will break apart muscle tissue during a self-digestive process called autolysis. Then the 'lifetime tracker' will float to the ocean's surface and detect light, plus cooler temperatures outside Otto's body. Those changes will trigger the device to ping scientists back on land, notifying them that the animal has died. “I'll get an email, a very sad email that says 'animal 5789 has started transmitting,'" says scientist Markus Horning. Horning developed the tags at the Alaska Sealife Center in Seward with funding from a National Science Foundation grant, and shipped two of them to The Marine Mammal Center. By figuring out how long Otto lives, and where and how he dies, Horning says scientists can get a better sense for whether he died a natural death or whether domoic acid poisoning played a role. If Otto has seizures caused by domoic acid, the device will track temperature spikes due to muscle activity. Those temperature spikes look very different than a sudden temperature drop—which is what happens if a sea otter is devoured by a shark. Horning says Otto and a second sea otter at the Marine Mammal Center, named Yankee Doodle, will be the first sea otters in the world to receive these tracking devices to study their behavior in the wild. But before Otto can roam free, he has to recover from surgery. Post-op, with his intubation tubes removed, Otto scrubbed his face and spent several minutes grooming as he floated in a private pool. In about three weeks, Otto will return to the ocean. It could be around 15 years before the device in his abdomen floats out of his decomposing body. Or, if Otto is less fortunate, the tag could be barfed up by a great white shark.